In a wide-ranging interview, Ukraine’s Ambassador to the EU, Mykola Tochytskyi, discussed his country’s EU agenda, the upcoming Eastern Partnership summit, relations with Russia, including gas and the Minsk agreement implementation, as well as the new language law which has antagonised Hungary. 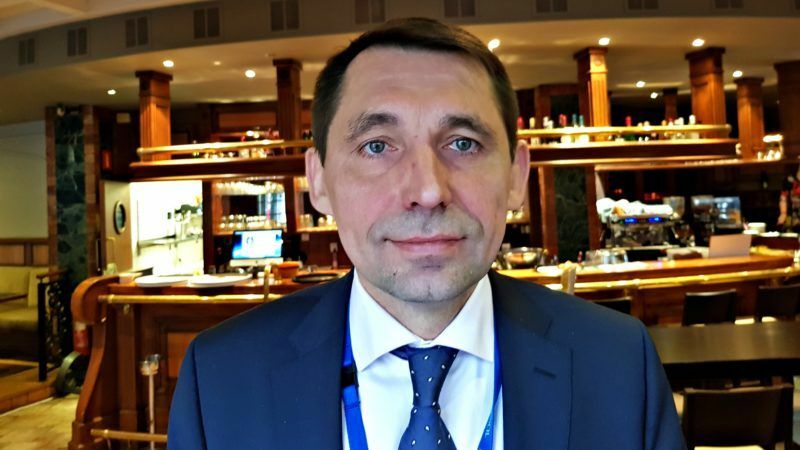 Before taking his present post in Brussels in 2016, Mykola Tochytskyi, a career diplomat, was permanent representative of Ukraine to the Council of Europe (2010-2016), head of the general service on international cooperation under the president of Ukraine. What’s new on Ukraine’s EU agenda? One of the upcoming events is the Eastern Partnership summit [on 24 November in Brussels]. Let me start with achievements. European integration is not just a technical procedure. This is something we fought on Maidan, the return to our European family. We achieved together the last ratification from the Dutch government of our [EU-Ukraine] Association agreement and DCFTA [Deep and Comprehensive Free Trade Agreement], which means a lot. For the time being, we have 42% of our trade with EU countries, which is a huge change compared to before. Yes, it has dropped dramatically. Some statistics before the revolution [Maidan] estimated at 63% our trade with Russia, and only 10% with the EU. And in two and a half years you see the difference. And this is not only agriculture, some people think that Ukraine, as a majority agricultural country, has re-directed its agricultural exports. It’s also about industrial production, aviation cooperation. Our Antonov plant is cooperating now with Belgium’s Depicon and Canada’s Bombardier. These are huge, enormous changes. Now we are concentrated on the implementation of DCFTA. For example a few days ago we adopted an action plan for the implementation of our Association agreement, which contained more than 2,000 tasks – what to do. And every two weeks our deputy Prime Minister checks how implementation is proceeding. They even put in place a system called “Pulse of the Association Agreement”, which soon will be open for the public and you would be able to see yourself what the level of performance in implementation is. We are also interested in the upcoming Eastern Partnership summit. We proposed concrete elements of the declaration to be adopted. And on the basis of the EU-Ukraine summit [12-13 July 2017 in Kyiv], our president proposed four big priorities: customs union, EU energy union, EU digital single market, and a possible Schengen association. We would like to see our European aspiration reflected in the declaration. Also, we would like more cooperation in interconnectivity, in road building, for example having a good road connection between Gdansk in Poland and Odessa port. Improving this connection could save 10 hours of travel. Moreover, this is something concrete which people will see. But you used reverse gas from the EU. Yes, but it’s cheaper and more secure. The Russians say it’s Russian gas anyhow. OK, no problem, we cannot avoid having Russian gas in Europe, but they cannot use economic blackmail against us. They have always used arguments like: “If you don’t do this, we will not give you a good price for the gas”. Now our approach is 100% commercial, as we wanted it from the beginning. Also what is very important for Ukraine is that our European partners keep the sanctions on Russia. But it’s one of the elements through which we can push a little bit our neighbour to respect the agreement. They are trying, even with this initiative of a peace-keeping operation, to oblige us to talks to the leaders of the so-called Donetsk and Lugansk republics. But those are not real leaders, they have not been elected. We talk to the actors of the Normandy process, there are concrete countries involved. That’s why I think sanctions is one of the elements. Of course, we would like everything in the Minsk agreement to be implemented, and my personal opinion is that we implement all of these elements. Element number one is the ceasefire, but there is no ceasefire, over the last two weeks there were even more attacks from the so-called Donetsk and Lugansk republics on Ukraine compared to last year. This is some kind of message “you should accept our conditions”. There are around 150 prisoners, from Crimea we have about 38 political prisoners, Crimean Tatars or Ukrainians who don’t want to take [Russian] citizenship or recognise the occupation of Crimea. We ask for the release of our compatriots who are under arrest in Donbas. The Minsk agreement is not about autonomy, it’s special status. But you know, there has been a decision of parliament about this, and there has been a first reading of the law on de-centralisation. Next steps can only happen under the pre-condition of ceasefire and exchange of prisoners implemented by the Russian Federation. Autonomy is about de-centralisation, and it’s not only about Donbas. A year and a half ago we started the financial de-centralisation of Ukraine, for the communities and regions. Now those regions can decide about 50% of the money and decide what their priorities are – to build a school or a hospital. There is also the issue of amalgamation, because we have communities from 600 people to 2,000, and the issue is to amalgamate them in order to make sure that they have effective management. Is Russia actively destabilising Ukraine via street protests including in Kyiv, even if they appear as well-intentioned, with slogans against corruption which of course exists, perhaps hoping for an anti-Maidan? Also, Saakashvili returned to Ukraine and said he will organise a “popular impeachment” of President Poroshenko, this December? If we are talking about Russia and its possibility to destabilise Ukraine, it’s not only in Ukraine but across Europe, there is an ongoing hybrid war. Maidan is a Ukrainian customs to solve issues on the city square. But you cannot resolve the issue of creating an anti-corruption court by one day of Maidan. The selection of the new judge for the Supreme Court took the last seven months or so. These issues take time. It was actually live, and you can see on YouTube how each of the candidates responded to questions. But when we talk about destabilisation, it’s not only Maidan, it’s only about terroristic acts, a bomb was thrown at a Ukrainian officer which was involved in the fight against the so-called Donetsk and Lugansk republics. The consulate of Poland in Lutsk was attacked with a grenade launcher, with the aim to cause harm to our relations with Poland. We captured those people and there are signs of involvement of our neighbour. They are looking at each possibility. Regarding Saakashvili, I’m not in a position to tell you if he is Russian agent or not, but the issue of Ukrainian politics is to be constructive. If you propose an agenda for removing the immunity from MPs, you cannot do it in one week. You need the first reading, then time for amendments, then a second reading. This cannot pass in one single session of the parliament, you will need two different sessions to adapt the law. But the demand is “Do it now, immediately, or you will have a Maidan outside of Verhovna Rada (the parliament)”. You can have realistic demands and unrealistic demands, which have nothing to do with the fight against corruption. Tell us about the law on education, which created tensions, in particular with Hungary. You submitted an op-ed, and when I read it, it appeared to me that the main purpose is that Ukrainian citizens who don’t speak Ukrainian should learn the language. But this is obviously misinterpreted or distorted. Is this part of the hybrid war? We can use this term. We have five neighbours on our Western border. When one of these countries started saying that article 7 of this law will kill the possibility for our minorities to study in their own language, our minister of education explained what this article means. We started discussing this issue bilaterally. Poland, Bulgaria, Romania, Hungary, and I can tell you that the majority of our neighbours immediately understood there was nothing against minorities, it was about our obligation, according to the constitution of Ukraine, to guarantee the necessary level of knowing the Ukrainian language. Secondly, we are part of the European Charter for Regional and Minority Languages (under the Council of Europe). And we will implement this charter. I can tell you that in the case of Bulgaria, we will even help to better prepare teachers in Bulgarian languages. It appeared that some Bulgarians schools in Ukraine, for example in Odessa region, lack good teachers. So we are putting in place study programs, together with Bulgaria. From the worse, you can have a better situation with a nation which is willing to cooperate. But with a nation which wants to use this law for the purposes of its internal election agenda, obviously, this is not possible. I mean Hungary, and I’m not afraid of naming the country. Yes. But when our minister of education met ambassadors of the EU member states yesterday (7 November), we explained what article 7 means and we want to be legalistic. That’s why we provided the law on education to the Venice Commission, to avoid any political situation about this. By the way, the law will enter into force from the next school year, in September 2018. You are not responsible for NATO relations but I’m still going to ask you: will Ukraine join NATO? Recently our parliament adopted a law about “Euro-Atlantic aspiration”. Of course, we want to be a candidate country to join NATO. But this is about dialogue. We need unity inside NATO. We have unity in our country, but we will need unity in NATO.